Jaina is the queen of board clears and she just received another one! The card reveal was meant to be done by Day9, but something came up and VentureBeat did it instead. They also interviewed Liv Breeden and Dean Ayala on the card and they have a video with its gameplay. As shown in the video, you get a random Mage Spell for each minion you Overkill. 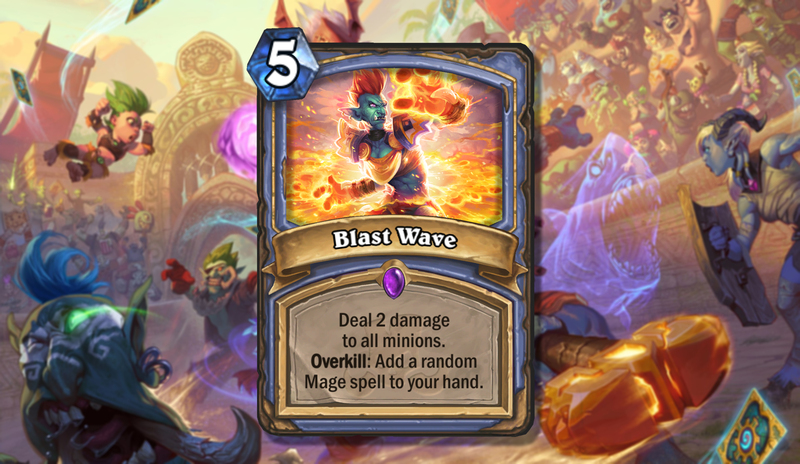 This makes Blast Wave quite good, but it's still not as good as Dragon's Fury (or Volcanic Potion). One might even argue that Priest's Holy Nova is more reliable than this and it's a spell that rarely sees play. Time will tell if this card sees play. Let us know what you think about in the comments below and feel free to pay a visit to our Rastakhan's Rumble expansion hub. Yeah... This card is crazy, if you play it at the right time. Even if you only get 2 monsters overkilled, you're likely to get your worth through the spells, as most mage spells are strong. If overkill will actually work per minion. Did you read the whole text? Yes, if played extremely badly it only does 2 damage to all minions for 5 mana (in which case you probably shouldn't even play it). But against any aggro deck it's definitely more useful. Don't forget that it deals damage to ALL minions and you get a random spell for ANY minion that gets overkilled (including your own!). Against an aggro deck that can definitely be a quick board clear and possibly 2-3 random mage spells. If it would do 3 damage it would probably be too strong for 5 mana (would lean towards full board clear and full hand of random spells against aggro). We all know mages have incredibly strong spells to 'randomly' obtain. Yes, it is a situational card and I still think it won't be played that much. But I think the cost and damage is definitely fine, cheaper or more damage would make the card too powerful on its own. I think they want to push the spellpower-deck with this, since we already saw a few cards for that the past expansions.